Established one year ago, in 2017, FairGo casino is definitely a solid alternative for any online casino players that enjoys high-quality pokies and services as well as the lots of bonuses a newer casino usually offers to their players in order to make a name in the industry. 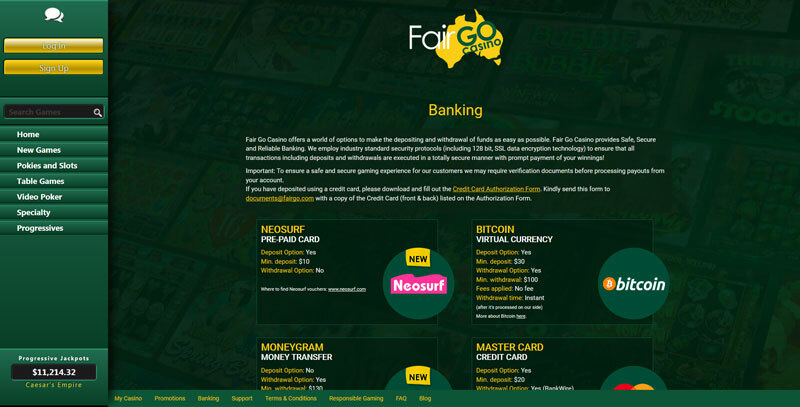 Besides all that, FairGo is especially designed with an Aussie twist so it goes without saying that Australian players will feel like home playing here. FairGo Casino is licensed by the government of Curacao, which means that players that want to give it a go should have no worries when it comes to fair-play and trust, this online casino has a strong seal of approval. 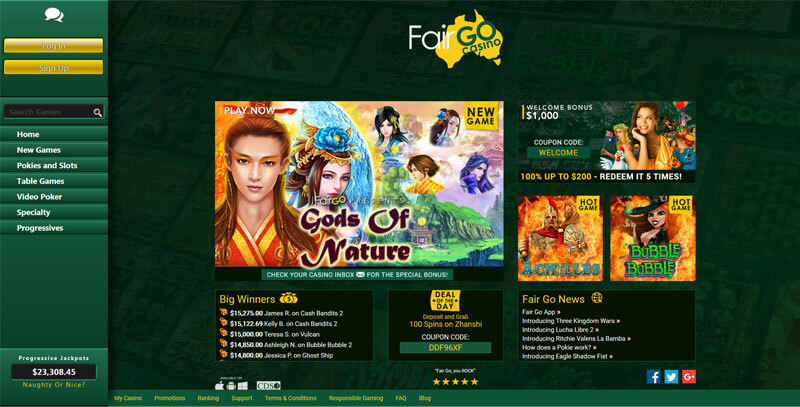 Fair Go Casino knows how to keep their customers entertained and that is very clear when you see the hundreds of online pokies and table games they have to offer. Teaming up with RTG for their online slots, FairGo Casino is able to provide some of the newest titles as well as classic pokies to satisfy the needs of even the most demanding casino players. As far as table games are concerned, there are plenty variations of Poker, Blackjack, Baccarat or even Pontoon that can be enjoyed by those casino players that are not such big fans of pokies. 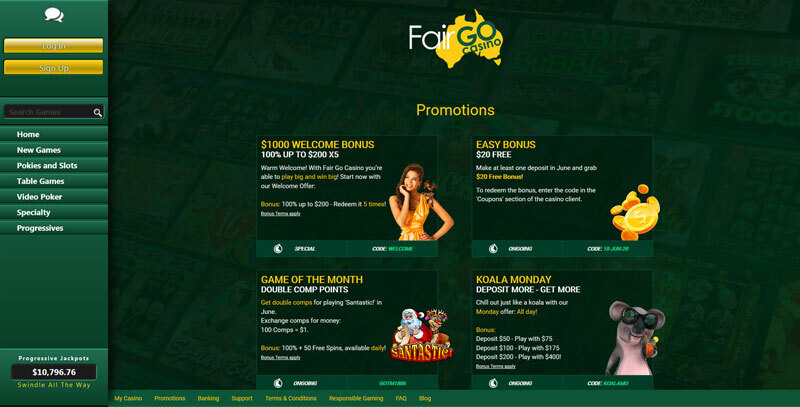 Aussie players sure love their bonuses and FairGo casinos has prepared the perfect bonus system in order to keep all of their customers happy. It all starts with a strong Welcome Package that stretches over the first 5 deposits made by newly registered players. The bonus they can get is identical over the first five deposits, consisting in a 100% up to $200. In order to use this bonus, all new players should use the WELCOME bonus code when they make their deposit.Besides this strong start in the casino with a total of $1000 as a bonus to boost winning chances, the rewards coming from FairGo casino keep on coming. There's a free $20 bonus available for anyone that makes a deposit the entire month of June, a special Koala Monday Bonus, a 30% cashback bonus available during weekends as well as a very well-conceived Loyalty Program. All players should know that all deposits are instant and there are no fees involved in both the deposit and withdrawal processes. Most of the deposit options can also be used for withdrawals and the withdrawal processing speed is competitive compared to other online casinos out there. Alright, so we've established that as far as bonuses and deposit options go, FairGo has a very strong game going on. What about customer support and ways for the players to reach them? It's no surprise that they're going strong in that department as well, providing three separate communication channels for their customers to get in touch. First of all, there's a 24/7 Live-Chat function available in multiple languages, then there's the Tool-Free Australian phone number 1800 953 261 as well as an international number that is not free. And last but not least, you can always contact them via email at support at fairgo.com for those of you that are not big fans of chatting or talking on the phone. Every inquiry you may have will be answered to in the fastest time possible as well as any other thing that may come up during the gaming process.